Who doesn’t love homemade noodles? Not many people that I know of, that’s for sure. They are very simple to make.You can use any flour you want to make them. It will work. You just get a different flavor and you may need to use more or less. 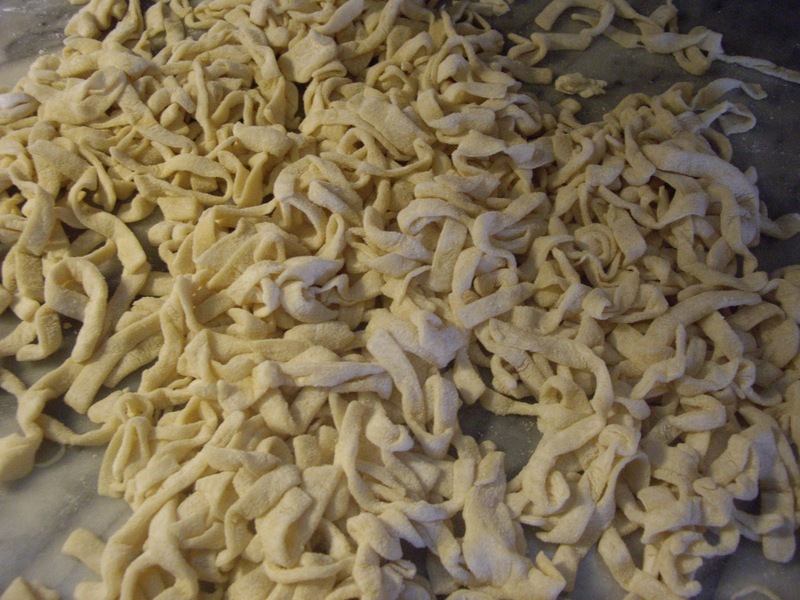 You will need a floured counter or cutting board to roll out the noodles on. You will also need a cutting knife and a rolling pin. You will need a large pan to cook the noodles in. A 4-5 quart Dutch oven works great. In a small break, break an egg. Add the water and salt. Beat slightly with a fork. Add about a cup of flour and stir in. Gradually add more flour until the mixture is really stiff. With your hands,mix it well until the dough is a ball and not sticky. You may need to add a little flour if it is sticky when you mix. Let the dough rest while you flour your counter. Turn the dough out onto your floured counter. With the rolling pin, roll the dough out as thin as possible. Turn the dough over and flour as needed so it won’t stick to the counter. If your working space is small, only roll out part of the dough at a time. When, you have it rolled out as thin as you can or want, cut the dough into quarters. Flour the dough and layer the quarters on top so you have one stack. Cut that stack in half and stack those on top of each other, flouring between stacks. Repeat until you have a rectangle shaped stack of noodle layers. With your knife, thinly cut the stacks into the length and width of noodles that you want. Once you have them all cut, make sure all the noodles are separated. They may just come apart from the stack by rubbing them and tossing them in the air. You also may need to carefully divide them if they are stuck. Let them rest while you prepare your water. Add about 6 cups water to your pan. Salt and bring to a rolling boil. Gradually add the noodles to the pan, stirring them as you add so they won’t clump. Cook for a few minutes until the noodles float to the top of the pan. This signals they are done. Drain and serve how you wish. Makes about 3-4 cups raw noodles. If you want to make beef and noodles or chicken and noodles, just add the noodles to your boiling broth and meat/poultry. Cook for 10 minutes over medium heat. If you want to thicken up the dish, turn the heat down to low and simmer til it is how you like. The size stack you cut your noodles into is determined by how large or small you want your noodles. My mom and grandma always cut them smaller so they made the stack into a smaller rectangle before slicing the noodles. I like them longer so my stack is a larger rectangle. The smaller the rectangle, the taller the stack will be.